Celeriac tart - pretty nice. Cheese croquette - nice and molten center. Foie gras bon bon - with a cherry coating. Very smooth both on the outside and on the inside. The amuse bouche was fava bean espouma, with cheese sauce and a sprinkle of hazelnuts. Speciale Ancelin N°4 from Bourcefranc-le-Chapus in the Marenne Oléron, wrapped in a thin layer of agar flavored with cucumber or French melon, and served on small, round discs of cucumber or French melon, respectively. Topped with a quenelle of French melon sorbet, and some crunchy peanuts. This was such a beautiful dish. Both the cucumber and the melon delivered refreshing and clean sensations in the mouth, and the sweetness from the melon sorbet somewhat neutralized the mineral flavors of the seas from the oysters. This reminded me of another oyster dish at Restaurant André, which blew me away. Le foie gras de canard - this is a dish that I no longer order at restaurants, because it has become so mainstream and common. This came with some poached rhubarb for the acidity, a piece of rice crispy on top, and a puddle of delicious tonka bean butter foam on the side. Needless to say, the execution was flawless. I may not have ordered it, but I'll always enjoy it when it's done well. There was also a little cup of rhubarb sauce topped with rhubarb granité to cleanse the palate afterwards. L'asperge de Jérome Galis - incredible. Proof that a simple dish with the freshest ingredients can be just as amazing. These asparagus spears were simply amazing. Simply drizzled with some olive oil, garnished with a single garlic flower, and served with a light and airy hollandaise sauce (menu indicates mousseline). Le Saint Pierre - slow-cooked John Dory, covered with a thin sheet of zucchini purée (menu says lardo), served with salicornia, a salicornia fish sauce, and avocado purée on the side. I find John Dory boring in general, but salicornia is always interesting - especially that sauce! The avocado purée was surprisingly a little acidic. Le pigeon - OF COURSE I would choose the pigeon over some Kagoshima wagyu... No-brainer here. Ossau - not too hard, actually, and a little salty. Couronne Lochoise - pretty mild for a goat cheese, simply creamy with just a little salt and a slight acidic finish. Saint-Felix - with ash in between the layers. Harder in texture, with more salt and acidity here. Munster - definitely pretty strong, and a little stinky. Bitter on the palate. Roquefort - as expected this was simply too salty for me on its own, so I had to take it with the fig jam. Le citron de Menton - a very refreshing lemon mousse, with delicious and crunchy pineapple confit, rice crispies, and faisselle sorbet. La forêt noire - a new take on the Black Forest cake, served with a sauce made with cherries and cherry liqueur. Inside the white chocolate shell was the classic chocolate cake with cherries. A quenelle of cherry sorbet on the side makes it complete. At the end of the meal, tea and coffee are served. 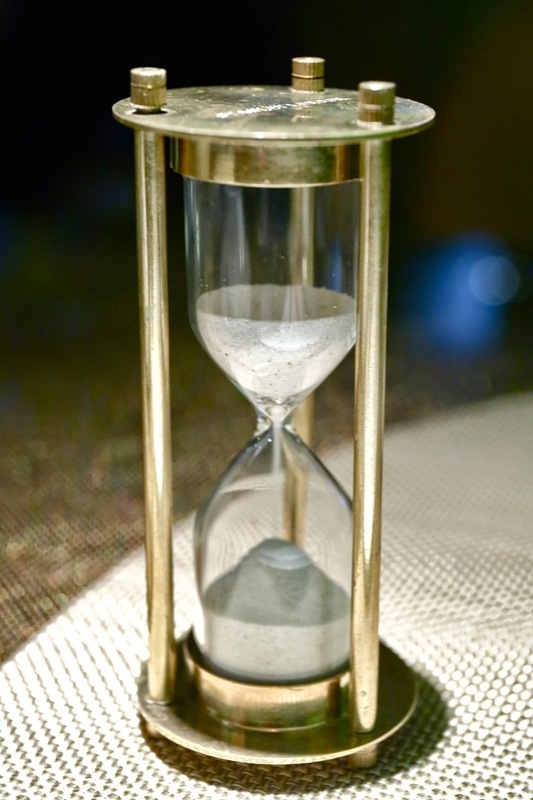 To ensure that diners give the tea enough time in the pot, they've provided a little hourglass which runs out in 3 minutes. Very thoughtful. The mignardises arrived to bring our meal to a close. Pistachio and jasmine cake with white chocolate - happy to have actually tasted the jasmine. Truffle and chocolate macaron - I definitely tasted truffle oil in here. Against my better judgement, I decided to order a bottle of Champagne. I inquired about the corkage charge when I called to make a reservation, and was informed that it would be HKD 700. W-T-F?! 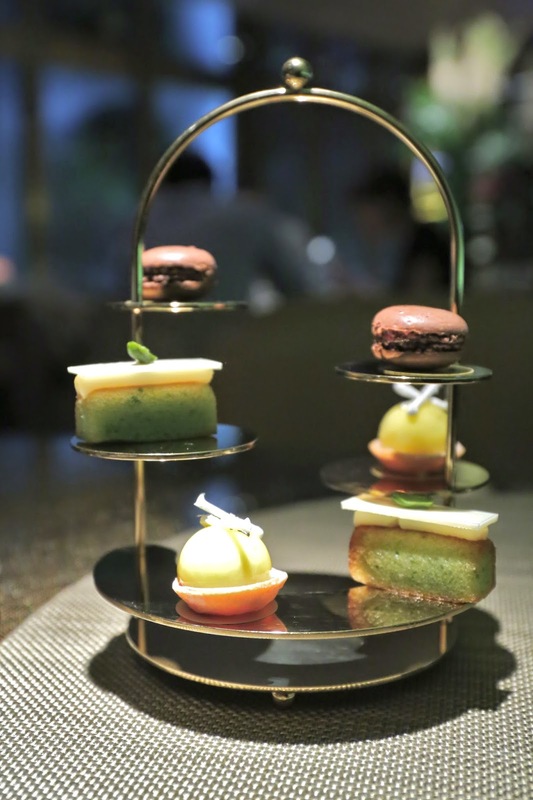 Paying HKD 500 in the city's 5-star hotels and Michelin-starred restaurants is something I am more than happy to do, but this just felt like highway robbery. I was very tempted to give the restaurant the finger by not letting them earn a dime on wine. But I did take a look at the wine list, and ended up picking a bottle of grower Champagne that I liked, at a fairy "reasonable" price. So I gave in and did something I almost never do - order a bottle off a restaurant's wine list. Françoise Bedel Dis, "Vin Secret" - ripe and caramelized nose, plummy notes. A little more fragrant later, and almost cane sugar, a little mineral and savory. Higher acidity on the palate, but ripe and smooth. Delicious. I gotta say that dinner tonight was immensely enjoyable. I came in with reasonably high expectations, and by the large the restaurant delivered. It is certainly one of the better fine dining venues in town, and I felt the quality delivered by the kitchen was commensurate with the price charged. Looking forward to coming back.